The Martin Jem ZR12 DMX is a mid-sized, portable fog machine with enhanced output to provide a continuous flow of dry, dense fog. 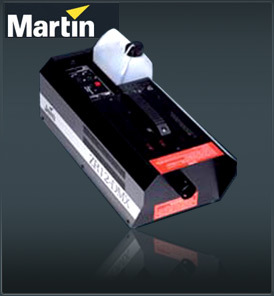 The Martin Jem ZR12 DMX uses a single channel of DMX as a variable output control. Use remote Din socket Pin 2 GND and Pin 5, 0-10v input. This pin needs 1.5v to heat the machine and 2-10v to run the pump when up to working temperature. The machine should be located in a well-ventilated area with a minimum of 200mm air space around the sides and top of the machine. The machine should only be used on level surfaces. The initial smoke output of the machine is hot, so the front of the machine should at least 1 metre from surfaces or people. Never leave the machine running unattended.Do not install above people’s heads. The ZR12-DMX includes all the same features as the ZR12-AL yet has added DMX input via a specially designed on-board interface for extra flexibility and control. The "crack" created during the initial burst of smoke is caused by the pump pressure overcoming the incredible back pressure of the heat exchanger. Jem’s unique Soft Start Electronics gradually powers the pump, eliminating this crack and ensuring a quieter and smoother operational level following initial start up. All Jem heat exchangers are designed for high efficiency performance. Only the purest grade LM24 aluminum is used in the production process which eliminates the risk of porosity (pockets of gas within the casting which can cause heater failure). All heat exchangers contain cuprous helicoils of at least 2.8 meters in length, ensuring a continuous flow of pure, dry, white smoke. Jem was the original pioneer of EPR, an intelligent means of warning of a drop in temperature which could result in ‘wet smoke’ (residue). The pumps respond to this signal by running slower and pumping less fluid, thus allowing the heaters to restore optimum operational temperature. This guarantees a continuous flow of smoke using highly efficient, lower wattage heaters. This uses a single channel of DMX 512 giving a full variable output from the machine. This important feature means that atmospheric effects can now become choreographed into the Light show or stage performance via the lighting console. Greatly appreciated by rental companies, this hand-held remote can be stored during transit on-board the machine, making it easy to find at show time and eliminating transit vulnerability. But storage isn’t the only advantage. Portability is greatly enhanced by having on board controls. This small yet crucial component is the last line of defense against catastrophic failure. Other manufacturers still depend on cheap plastic whereas Jem’s DTPD is made from a solid ceramic composite. This guarantees extremely precise overheat monitoring and is unaffected by ambient temperature changes. All Jem smoke, haze and heavy fog machines are designed to carry removable fluid containers of varying sizes depending on the models application. The removable container makes for quicker refills and protects the machine from damage through spillage in transit.